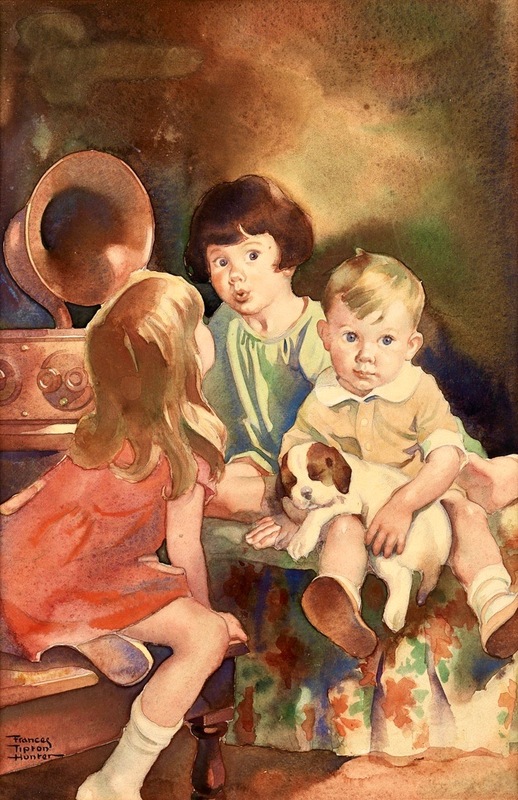 Like many other women illustrators, Frances Tipton Hunter made children her specialty. Her own childhood was scarred by the death of her mother when she was only six years old, and she was raised by her aunt and her uncle. Her art talent appeared early in high school, and she graduated with honors from the Philadelphia Museum School of Industrial Arts. Further study at the Pennsylvania Academy of the Fine Arts and Fleisher Art Memorial prepared her for her debut as an illustrator. 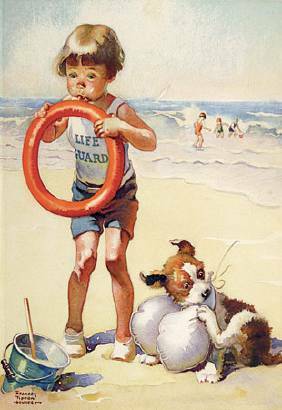 Hunter’s early work appeared in the Woman’s Home Companion, followed by illustrations for Collier’s, Liberty, Good Housekeeping, and a long series of covers for The Saturday Evening Post. She also produced an extremely popular series of calendar paintings over a period of eleven years, and many advertising illustrations for products such as Listerine and Occident Flour. A book, Frances Tipton Hunter’s Paper Dolls, was published in 1943 by the Whitman Publishing Company. Until the latter half of the 20th century, male artists dominated the world of illustration. There were a few women bold enough to enter into the very-competitive profession, however, and one of those “bold women” was Williamsport’s own Frances Tipton Hunter. Hunter is acclaimed for the watercolor illustrations that graced and brightened the covers of the Saturday Evening Post, Ladies' Home Journal, Colliers, Redbook, Good Housekeeping, Cosmopolitan, and other national magazines. Unlike the lives of many of the other Williamsport women featured in this series, Frances Tipton Hunter's life has been relatively well documented. She has been featured in numerous newspaper stories and has entries in Who’s Whos and art reference books. Her obituary appeared not only in our local papers, but also in the New York Times. A Google search of her name reveals her work for sale on print and poster sites, eBay, and Etsy. The two children’s books she illustrated, The Frances Tipton Hunter Picture Book and Boo Who Used to Be Scared of the Dark, have been translated into several different languages. Her artwork is in the collections of Penn State University and the University of Minnesota. Pieces hang in the James V. Brown Library and in the Taber Museum of the Lycoming County Historical Society. Frances drew from the time she could hold a pencil. In a September 1920 interview with Williamsport journalist Dorothy Deane, Hunter recalled that at the age of three, while visiting her grandmother--apparently bored and not impressed with the wallpaper in the stairway--she drew on top of it. She worked up as high as she could reach, drawing figures up and down the staircase—lopsided figures since “the first leg drawn would come to the edge and then the next one further down would have to be much longer” (Dorothy Deane, “In Women’s Realm,” Williamsport Sun, Sept. 22, 1920). In a handwritten autobiographical piece now in the collection of the Lycoming County Historical Society and online in the Lycoming County Women’s History Collection (www.lycoming.edu/orgs/lcwhc), Hunter commented on how she began her career in illustration. She credited her teachers in the Williamsport schools, saying specifically that “it might have been the time the late Harvey Stabler asked me to draw three puppies in a basket, captioned, ‘We Bark for Transeau.’ “ Puppies would become one of her favorite subjects. Frances Tipton Hunter was born on September 1, 1896 in the town of Howard in Centre County, Pennsylvania. Her parents were Michael Hunter, an insurance salesman, and Laura Tipton. When she was only six, her mother died. Although her father was still living, Frances and her older brother, Harold Tipton Hunter, were raised by her mother’s sister, Frances, and her husband, Edward McEntire. Their home was on Locust Street in Williamsport. Hunter attended Williamsport High School, graduating with the class of 1914. Modestly, she said that she distinguished herself there “only by contributing some pretty bad drawings to the Cherry and White and playing unspectacular basketball.” In actuality, those “pretty bad drawings” are now collector’s items. After high school, Hunter attended the art school of the prestigious Philadelphia Museum School of Industrial Arts (now the Philadelphia Museum of Art), where she graduated with honors. Later she studied at the Philadelphia Academy of the Fine Arts, the oldest museum and art school in the country, known for encouraging female artists. Her first paid work was for the famous Philadelphia department store John Wanamaker’s. While still an art school student, she was hired to illustrate their line of children’s fashions for catalogs and advertisements. She was paid $500. But eventually she did break into the male-dominated field. 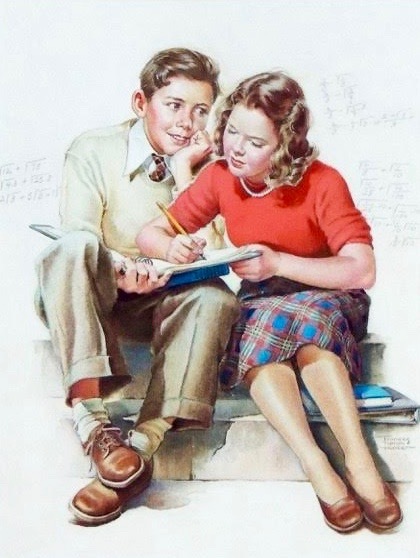 Like those of the few other female artists of the time, her illustrations most often featured children and animals, drawn in an upbeat, homey style resembling that of Norman Rockwell. Her illustrations became so famous that they were made into calendars and jigsaw puzzles and paper dolls. A series of paper dolls that she created for the Ladies' Home Journal were so sought after that a compendium of her doll artwork was later published. 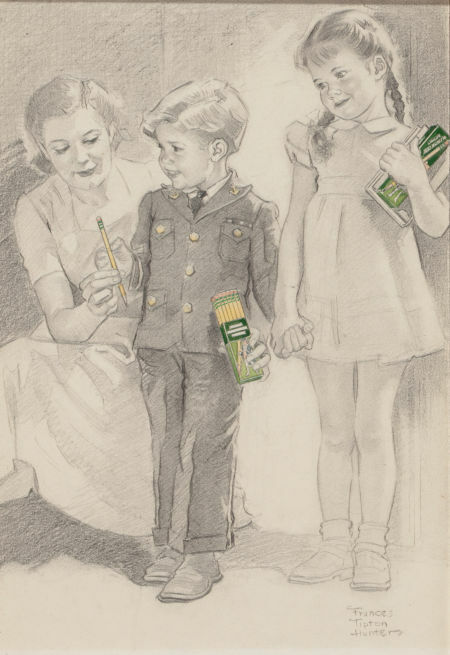 She continued to draw advertisements for numerous firms, including Eveready Batteries, Firestone, Listerine, and Westinghouse. Hunter also painted in oil. Several of her oil paintings are in the collections of the Brown Library and the Taber Museum. One of those paintings is a portrait of a handsome young man, perhaps her brother, who died while Hunter was still in high school. References allude to urban scenes that she painted in Philadelphia with African American subjects, but these paintings, apparently unsigned, have not been located. If any reader is aware of any of Hunter's works in oil, the Historical Society would be pleased to evaluate them. Although she lived in New York and Philadelphia, Frances Tipton Hunter always considered Williamsport her home. She died in Philadelphia in 1957, at the age of 61 and is buried in Howard, Pennsylvania, where she was born. A community-wide effort is in place to restore and preserve Hunter’s artworks owned locally. Spearheaded by Williamsport artist Marguerite Bierman, the project has re-housed the works belonging to the Brown Library, using archival quality materials. The library and the Historical Society want to assure that our Williamsport artist is appropriately remembered and celebrated.